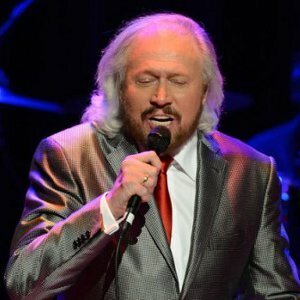 Barry Gibb is reportedly set to join the band Coldplay during their closing slot at Glastonbury Festival. While the Bee Gees singer had been rumoured to be making an appearance previously, he has now allegedly been invited to perform a medley of iconic Bee Gees hits with Chris Martin's group on the Pyramid Stage on June 26 at Worthy Farm. Barry, 69, is the only surviving member of the Seventies band he founded with his brothers Robin and Maurice Gibb in 1966. The singer, songwriter and record producer rose to worldwide fame alongside his brothers as one of the most commercially successful and critically acclaimed groups in the history of popular music. A source revealed to British newspaper The Sun: “Chris was delighted to be asked to headline again but told Michael he wanted to bring some friends along, too. “Barry had already been asked to perform but didn’t have time to perfect a full set with his touring band. As soon as Chris got wind he asked Barry if he wanted to come on stage with Coldplay," the source added. Coldplay will become the first group to headline the festival four times. They previously appeared in 2002, 2005 and 2011 but frontman Chris, 39, allegedly told Glastonbury's boss Michael Eavis he would only return if they could mix it up with guest appearances, like his recent slot at the Superbowl in February this year where he performed with Beyonce and Bruno Mars. Thankfully Barry was keen on the idea: “He agreed straight away. The band are putting a Bee Gees medley together cramming in all of their classics. It’s going to be really special. There are likely to be a few other surprise guests on the night too, which are still to be decided," explained the source.